The movie Ant-Man was one of the best Marvel movies to date! The best thing about this film was that it was its own movie and that it progressed the MCU in a perfect way without overshadowing the main movie’s plot, which Age of Ultron struggled with. The film didn’t try to beat you with a hammer with the Avenger references and made them feel natural and not overwhelming, which again some MCU movies do that. There was a perfect balance of everything which never left a viewer overwhelmed nor underwhelmed. The chemistry was perfect in the movie making every character interesting. Each characters’ interaction never took away from the movie, but always added which doesn’t happen often in all movies. It is not only humans, but also ants that had awesome interactions which made it feel like even little things like this matter. The characters in the story had a natural progression, but there was a time where a character progression felt a bit rushed, but not too rushed. Each person managed to make this a funny film which highlights of what the movie is. Michael Douglas and Michael Pena were the best characters in the movie. Each character felt useful and not crammed in. The villain of the movie was a great until a certain point. He seemed very scary, menacing and evil, until the last act of the film where he became a very generic Marvel villain. Towards the end of the film he felt more of a plot point then a character that would have served better as. It felt as if the villain didn’t matter as much as every other character. It’s like the studio wanted to get it over with this villain so that they could get to a different one and do the same. Marvel Studios needs to understand that to have great villain sometimes you have to keep him throughout more films then just one which made Loki so lovable. It would also be nice to see a change up in the villain and have him be less of a physical threat but more of a mental one, and this is where Marvel had the chance to do so. Perfect conclusion to Marvel’s Phase 2. Even though the film wasn’t too much of an action film it knew it perfectly and the heist element of the film made it very different and unique proving that Marvel Studios will always be great at what they do. 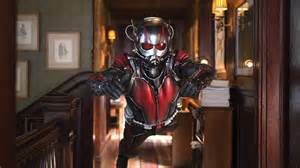 Ant-Man was funny, entertaining and it proved that every scene in the film matters. This is a movie for everyone where every person can find something that will make them enjoy this film.